The Start of the 2011 INDY Half Marathon. Tom is on the left side of the picture, the bald guy in corral B, right next to "Waldo". Linda and I made another race road trip, this time to Indianapolis for the 35th Running of the OneAmerica 500 Festival Mini-Marathon. 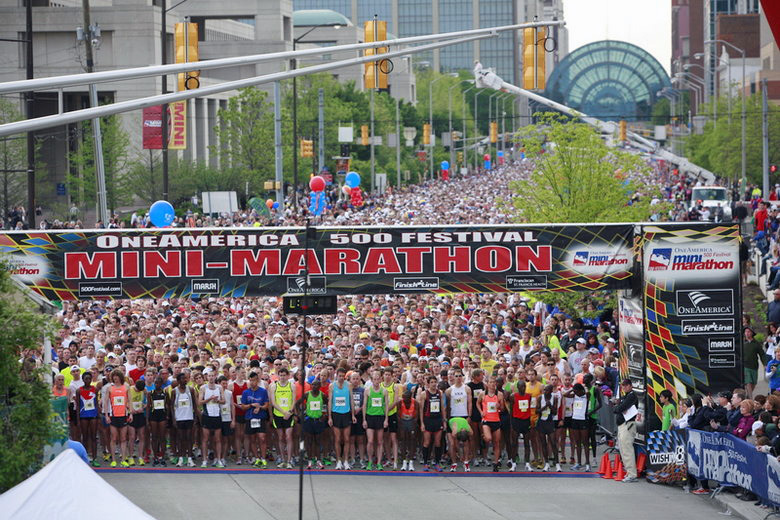 This half marathon is billed as the largest in the United States. Not only the largest half-marathon in the U.S., but the 500 Festival Mini-Marathon is regarded by Runners World, as one of "A Half Dozen Hot Halfs" in the world. I had some reservations leading up to the event as I found the size of the event daunting. My typical race experience involves showing up an hour or so before the start, immediately finding a parking spot, do the traditional warm-up and Port-A-John routine and go to the line surrounded by familiar faces. I felt sure this adventure would not be exactly like that, but I had Linda as a guide. Having run many large races including Chicago and Boston, she assured me the scope of the race would be “different” from what I was accustomed but a great experience on a good course. She was right and I was impressed with the organization and attention to detail that was focused on providing a great race opportunity to the 30,000+ entrants. From a previous race time we were able to get corral assignments that worked out well for me but not so much for Linda. I was in corral “B” which was good and I was able to settle in my pace from the beginning. Linda was in “F” which turned out to be a little slow and she spent the first 3 miles weaving in and out of traffic, over the curbs and in the grass. I think this caused her to barely miss her goal of achieving a qualifying time for a Chicago Marathon corral seeding. So, now we are looking for another fast half before the August cut off. We think not being able to closely run the tangents, due to the size of the field, added 1/10 to our distance run. That is if you believe in the accuracy of Garmin’s tracking technology. We both wore a Garmin 410 and both register a bit over 1/10 longer than the 13.1mile half marathon distance. Oh well :-)!! All in all we were pleased with our times, 1:34:34 and 1:51:31 - Linda never ceases to amaze me, I think running 1:51 is fantastic considering her longest week this year has been 28 miles and her average is just over 20 miles per week. The experience of my first really big race was definitely a positive one, with fireworks at the start and bands or cheer groups every 200 meters (I’m not exaggerating!!) not to mention the traditional on lookers gave great support to all. Add to this the fact that I got to run a lap around the historic Indy 500 race track too. The Expo was awesome as were the post race amenities. We highly recommend this race and you need to add it to you bucket list! Maybe we will see you there in 2012!! !